For children dying from incurable cancer or other terminal illness, the end of life is supposed to be a time of intimacy surrounded by family and loved ones. But when parents or bystanders call 911 out of panic or for help to ease their child’s suffering, they sometimes prompt a rescue process that is out of their control. The summoned EMS workers must do everything possible to keep the child alive and get them to the nearest emergency room, even if that means going against family wishes and the physician’s treatment plan, according to Dr. Paige Volk, a pediatric critical care physician at the University of Iowa Children’s Hospital. While terminally ill adults can have advance directives from their doctors forbidding such interventions outside the hospital, a little-known Iowa law does not allow the same power to similarly situated minors and their parents. 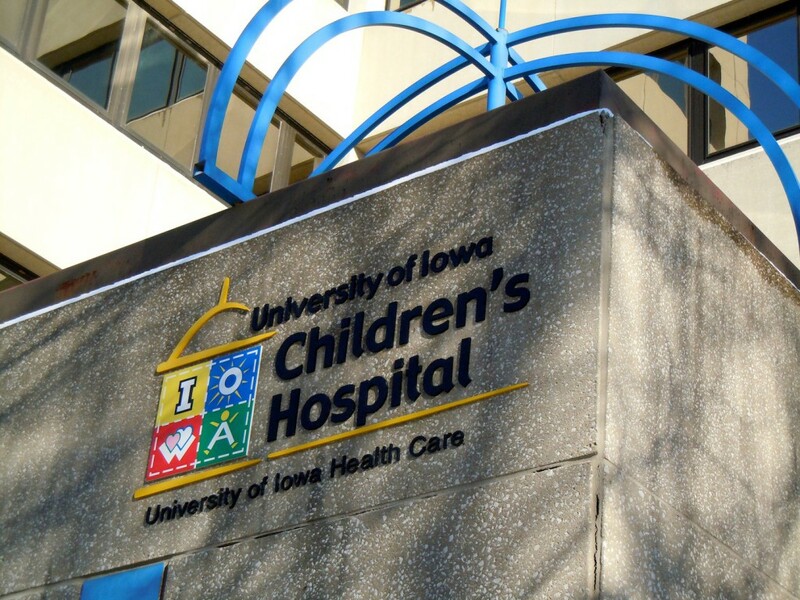 The law puts Iowa out of step with the ethical position of the nation’s largest association of pediatricians and with an increasing number of states. Five years ago, only 17 states had such laws. But in the last five years, the number has grown to the point where Iowa is now in a “large minority” of states, according to Dr. Armand Antommaria, a pediatrician and chair of the ethics committee and ethics consultation service at Primary Children’s Medical Center in Salt Lake City. “It’s ethically acceptable to forego CPR when it is unlikely to be effective or when risks outweigh benefits, including the parents’ and child’s assessment of the child’s quality of life,” the American Academy of Pediatrics says. “I have had to make families [and] patients aware of what would happen if EMS is contacted during a stressful (possibly end of life) event at home,” Volk said. That means EMS technicians will use chest compressions from CPR, shock the heart, insert a breathing tube or any other procedure to revive the child. In some cases, such interventions can actually cause additional injury to the dying child. How often such situations occur in Iowa could not be determined, but, according to a 2001 study in the journal Pediatrics, 5,000 children with “complex chronic conditions” were in the last six months of their lives on any given day in the United States. Privacy laws prohibit health care providers from revealing specific cases. Adults 18 or older with terminal illness can control treatment outside of a hospital by obtaining an advanced directive known as an out-of-hospital do-not-resuscitate order. It provides legal protection for EMS to withhold care. According to current administrative code individuals under the age of 18 cannot obtain this advanced directive, but their physician can order resuscitation to be withheld as long as they are in the hospital, said Katrina Altenhofen, children’s program manager for the state’s EMS. Volk, the critical care pediatrician, supports revising Iowa’s law to allow minors with life-shortening illnesses to have out-of-hospital do-not-resuscitate orders. “If a patient’s wish is to experience end of life in the comfort of their own home, I feel strongly that a life-threatening event in a public place or a 911 call from home should not lead to an unwanted resuscitation or admission to the hospital,” she said. But legislation providing that protection apparently is not on the agendas of legislators or the medical establishment. None was proposed last session, and no groups have formed to carry it in the upcoming session, said Amanda Ragan, D-Mason City, chair of the Senate Human Resources Committee. “I haven’t had any indications for change,” she said. The Iowa Medical Society has no plans to advocate for it. University of Iowa spokesperson Tom Moore said the UI does not have a position on the issue. 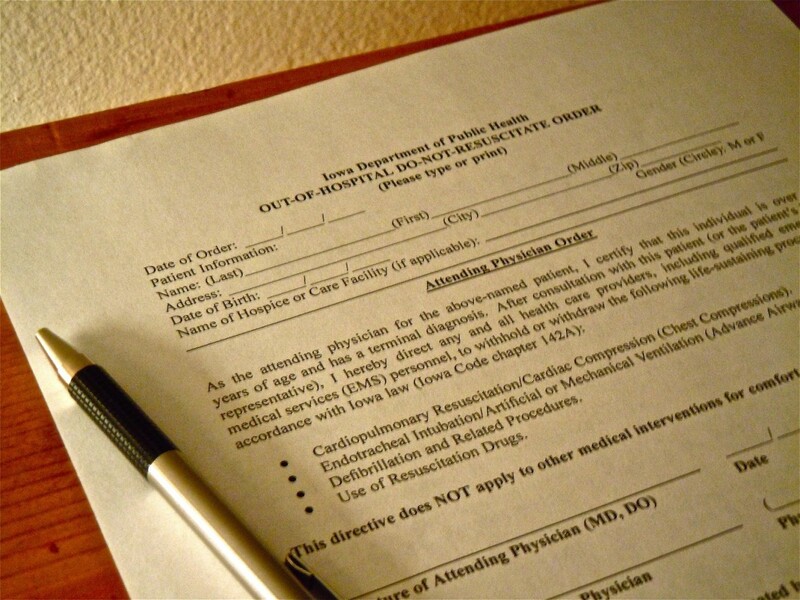 For patients 14 and older who have decision-making capability, UI Hospitals and Clinics guidelines say “the decision to write a [do-not-resuscitate] order should be based on the consent of the adolescent patient and his or her parents or guardian.” These guidelines only apply to patients who are admitted to the hospital. Altenhofen, the EMS program manager, said hospitals can send terminally ill children home for hospice. But Volk said Iowa’s rural nature makes pediatric hospice inaccessible to many. Rose Eaves of Iowa Hospice Service said her organization serves 90 counties but doesn’t have the qualifications needed to offer specialized pediatric care. Central Hospice of Iowa offers such services but covers only 35 counties in central and southern Iowa. The absence of legal authorization for out-of-hospital do-not-resuscitate orders for children in Iowa is troubling, said Antommaria, the Utah pediatrician. Utah allows pediatric do-not-resuscitate orders away from the hospital. “There are parents of children and adolescents who would want to legitimately forgo CPR, and without an authorized out-of-hospital do-not-resuscitate order they are at risk of receiving unwanted CPR or not receiving other appropriate medical interventions,” he said. Sheldon Kurtz, a University of Iowa law professor and expert on health legislation, said, “When you don’t have a statute like this, EMS personnel are basically taught to save the patient; get them to the emergency room still breathing. If there’s a problem let them sort it out [at the hospital].” He declined to say if he favors changing the law. Patients who obtain these orders wear a necklace or bracelet that alerts EMS personnel not to attempt resuscitation. Determining when to withhold resuscitation presents a difficult ethical question. “The state on the one hand wants to honor a human being’s right to refuse life support, but they also want to protect the constitutional right to life,” said Dr. Lauris Kaldjian, an associate professor of internal medicine and director of the program in bioethics and humanities at the University of Iowa’s Carver College of Medicine. “By giving freedom, you’re providing opportunities for some things to be misunderstood or even misused,” he said. In 2002, do-not-resuscitate legislation for seniors generated little controversy in the legislature, said Patricia Harper, a former Democratic senator who helped shepherd the bill through the Senate Committee on Human Resources. It passed both houses easily. But prior to reaching the legislature, 45 different stakeholders such as religious groups, medical personnel, anti-abortion groups and advocates for the elderly were involved in drafting the proposal in a protracted debate that went on for 18 months, said Fultz-McHenry, the policy executive for the Iowa Medical Society. “It was a very contentious process,” she said. At the time the legislation was enacted the environment was not favorable for a pediatric provision, according to Altenhofen, the EMS children’s program manager. She said some felt children should not be able to obtain do-not-resuscitate orders, because it would mean giving up on trying to cure them. “By and large, our society looks at adults and children differently in the sense that if an adult makes a decision with clarity of mind, repeatedly considered and carefully articulated to a physician, we do that one way,” Kaldjian said. Because children are unable to make informed decisions for themselves, some question who is best able to decide for them. Kurtz, the law professor, said the statute may reflect back when people distrusted the motives of parents of handicapped and disabled children. “There’s always concern that parents aren’t acting in the best interest of their children,” he said. He believes children over 14 should have the right to make their own healthcare decisions. Steve Spenler, Johnson County ambulance service director and a 20-year EMS veteran, did not know about the prohibition on pediatric out-of-hospital-do-not resuscitate orders. He said his emergency workers and parents have never disagreed on resuscitating a terminally ill child. He said paramedics would exercise discretion, look at the whole situation and talk with family, bystanders and a physician. “Based upon the information provided it would ultimately be the physician’s decision,” he said. 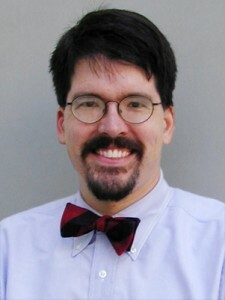 Dr. Charles Jennissen, an emergency physician and the University of Iowa’s pediatric emergency medicine director, said, lack of do-not-resuscitate orders in an emergency could cause problems, because EMS personnel would not be fully aware of medical issues or whether the patient is terminally ill. “Obviously an out-of-hospital do-not-resuscitate order would be helpful particularly for EMS,” he said. Families caring for a dying child at home may panic when death nears and call 911, according to Altenhofen, who said she speaks from experience. When her son was growing up, he went into cardiac arrest several times. CPR is not always effective. Sometimes, risks outweigh benefits, such as for patients with brittle bone disease called osteogenica imperfecta; CPR chest compressions could cause severe internal injuries, Antommaria said. EMS can still provide critical palliative care to a dying child, he said. They can relieve discomfort and suffering. If a child suffers acute shortness of breath, they could provide oxygen, suction airways or give pain medicine. “It doesn’t affect a huge number of children, but it has important implications for the children it would affect,” he said. Primary Children’s Medical Center Salt Lake City. Despite that added requirement, the law still gives parents of terminally ill children in Utah a choice. It’s a choice that Iowa parent Diane Wiederholt, whose 13-year-old daughter Maggie died this past February after a lengthy illness, thinks Iowans should have.